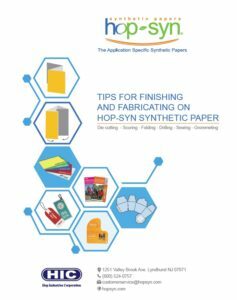 July 6, 2017 — Lyndhurst, NJ — Hop Industries, manufacturer of the durable Hop-Syn synthetic paper, today released helpful tips for finishing and fabricating on the various grades of Hop-Syn synthetic paper. The piece highlights numerous post-press options — from die-cutting, folding and scoring to drilling, sewing and grommeting — along with advice to help customers get the best results with the durable substrate. Contact a Hop-Syn synthetic paper expert at 800-524-0757 or contact us to request the free technical document. 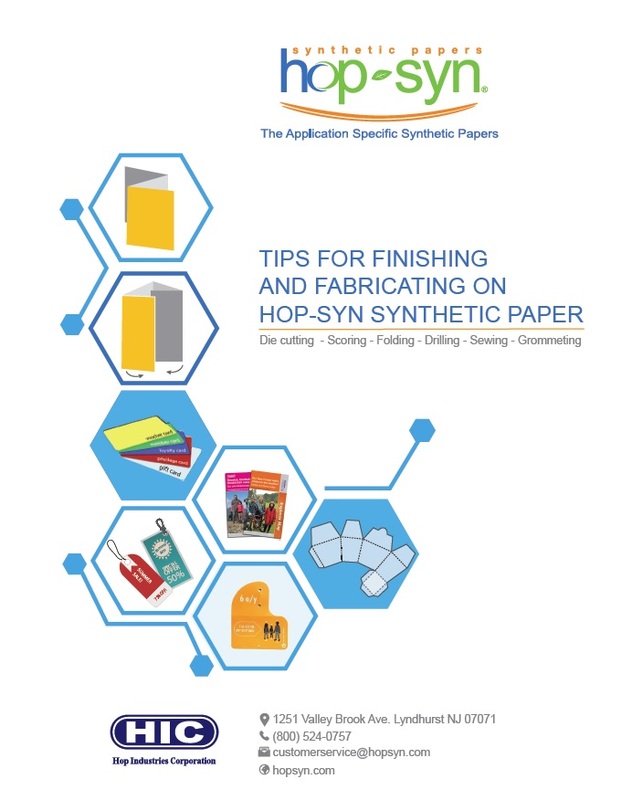 The Hop-Syn technical tips for finishing and fabricating is a valuable resource to get the most out of the synthetic paper grades while extending the life of the processing equipment. For example, it explains why to use a wax paper or carbon paper when drilling in short lifts and highlights the machine direction to get the best folding. It also gives the ratio of web speed to die pressure, and explains why maintaining accurate adjustment of die-to-anvil contact is important for success. For more information, visit www.hopsyn.com or call Hop Industries at 800-524-0757.